From 1977 through 1981, the Jays had stumbled through five seasons of mostly bad baseball. How long could .359 baseball (270 - 482) bring fans out to the ballpark? How long could you sell them on coming to see the stars of the American League, with very little hope for the home nine ever getting their act together? To be fair, they were assembling quite a lot of young talent, but that hadn't translated into wins yet, and let's face it, wins are what bring fans out to the ballpark in droves. The novelty of big league baseball in Toronto and seeing all the different stars on the opposing teams was starting to wear thin with the fans, and it showed. In 1981, they had their worst ranking for attendance in the history of the franchise. They finished 11th in the 14 team American League in attendance. Something needed to change. That's right. Beer was now available at Excruciating Stadium. It would have been nice to have it for all of those 100 loss seasons, but better late than never. Bobby Cox brought with him a platoon system, which was deployed at many different positions. Catcher (Ernie Whitt/Buck Martinez), Third Base (Rance Mulliniks/Garth Iorg), Left Field (Al Woods/Barry Bonnell), and Right Field (Hosken Powell/Jesse Barfield) were the four main ones if memory serves (please forgive if memory doesn't serve too well). The DH was a bit of a hodge-podge collection of old guys that seemingly numbered in the hundreds. Willie Upshaw, Damaso Garcia, Alfredo Griffin (with some 20 year old kid named Tony Fernandez looming in AAA Syracuse all year), and Lloyd Moseby held down every day jobs at 1B, 2B, SS, and CF respectively. The offense finally got up over 4 runs a game (not exactly booming, but baby steps people), and the pitching and defense had its best season of the six so far. It was a solid 78 - 84 season, which allowed for a tie for last place with Cleveland! We were no longer lonely cellar dwellers. We had company! The pitching was absolutely stellar, led by the big three (and they really were a "big three" that year) of Stieb, Clancy, and Leal. The bullpen was actually decent too, with Dale Murray, Roy Lee Jackson, and Joey McLaughlin putting together solid seasons. In 1982, Exhibition Stadium was a park primed for offense. That year it had a 110 multi-year Pitching Park Factor, and a 108 one year Pitching Park Factor, where over 100 favours batters, while under 100 favours pitchers. Just for reference, in 2016 Coors Field had a Pitching Park Factor of 117 for both multi-year and one year factors, so yeah, Exhibition Stadium circa 1982 was a bandbox where the wind could do crazy things that generally favoured the hitters. Despite this obstacle, the pitching and defense combined to only allow 701 runs. What about the Cy Young Awards? Dave Stieb led MLB in CG with a staggering 19. In exactly half his starts, he went the distance. He led the AL in SHO with 5. He led the AL in IP with 288.1. He led the AL in Batters Faced with 1187. He led the AL in bWAR by a mile with 7.7 (Rick Sutcliffe was next closest at 5.7). He was 4th in fWAR (4.8), third in REW (2.99), third in ERA+ (138). Pete Vuckovich walked away with the hardware though, and well, let's put it this way, you could probably make a case for about 20 guys ahead of him, including his own teammate Rollie Fingers. As for Stieb v Morris in 1982, well it would have to be Stieb because nobody was better IMO. Stieb 3, Morris 1 for those keeping track. Vuckovich must've been a great quote or something because this is two years in a row (1981 and 1982) now where he's put up decent, but not spectacular seasons and gotten serious consideration for the Cy Young, and now won the Cy Young. That's the way it was back then though: pitch reasonably well for a winning team, accumulate lots of pitching wins, and you'd get serious consideration for the award. Nothing we can do about it now, except to assess what might've happened had they pitched in a time of more advanced stats. Quisenberry and Zahn don't make my top ten either, but both were on teams that won 90 or more games that year, so that probably explains it sadly. Then again this award has evolved over time to be the award for the best pitcher, not just the best pitcher on a very good team. Maybe that can happen for the MVP Award too. One can only hope. Maybe it already has with Trout this year and Harper last year. As Fergie Olver (AKA The Reeeally Creepy Game Show Host and Sideline Reporter) used to say: "How about those Blue Jays!". I've got Stieb at #1, Clancy at #8, and Leal at #12. It really was a great year for the trio, as they combined to start 116 of the Blue Jays 162 games. Yes, you read that right. That's not a typo. The trio averaged 39 GS over a full 162 game schedule pitching very well in that bandbox of a stadium for half of their games. In fact they combined for just over 800 IP. The average for the three of them was about 268.1 IP. No way do you see that these days and perhaps rightly so, as Stieb was still just 24, Leal was 25, and Clancy was 26. Time was on their side. Or was it? Season number seven became winning season number one in franchise history, as the Blue Jays would go 89-73 on the year. Stieb was once again superb, but Clancy and Leal fell off and became more mid-rotation starters than top end starters (perhaps too many innings in 1982?). The bullpen was an absolute hand grenade brigade armed with kerosene that year though. Thankfully for the team's (and their fans') sake, the offense kicked it into high gear in 1983, scoring 795 runs (or 4.91 per game, now that's more like it! ), and for the first time in team history they had a 100 RBI guy (Upshaw with 104), and a 100 R guy (Moseby also with 104). Moseby was awesome that year and had a 6.0ish WAR season. The team had a nice run of being tied or in 1st place in the AL East from June 24th through July 25th, and for once we had meaningful baseball after the All-Star break (at least in August), until the bullpen blew up real good on the road against the Orioles and Tigers in late August with walkoff losses in four of five games (including three straight in 10 innings!) from August 24th through the 28th. Painful stuff folks. Excruciatingly painful stuff. Pat Gillick picked Doyle Alexander up off the scrap heap (he previously had been with the Yankees) just after Canada Day, and he eventually straightened things out winning his last seven decisions of the season. Perhaps a portent of good things to come from "Dour Doyle"? Last but not least, the awards. Not one vote for Dave Stieb from the writers. Not one. Remarkable. His team had improved by 11 games in the standings, yet his Cy Young stock went from 4th place to no place between 1982 and 1983. Huh? 24 wins for Hoyt, 45 saves and a 1.94 ERA for Quisenberry (on a 79 win team), 20 wins for Morris, 22 wins for Dotson, 21 wins for Guidry, and 18 wins for McGregor on the AL East division winning (and eventual World Champion) Baltimore Orioles, with just 17 wins for Stieb. That must be the reason. Ugh. Stieb once again destroyed the field in bWAR (7.0, Quiz was second at 5.5), was 4th in fWAR (5.1), 2nd in WPA (4.02, Quiz was first at 4.19), 1st in REW by a mile (4.64, Quiz second at 3.33), 3rd in ERA (3.04), 3rd in ERA+ (142), 3rd in WHIP (1.137), 2nd in H/9 (7.22), 2nd in IP (278.0), 3rd in K (187), 3rd in CG (14), tied for 2nd in SHO (4), 1st in HBP (14, ok it's not good to place first in this stat, but it was a part of Stieb's nastiness - it suggests that he pitched inside a lot), and 2nd in BF (1,141). Some of these stats would've been available back then, and the writers had five slots on their ballots, but not one vote went to Stieb. Amazing. Also, Stieb 4, Morris 1 so far. The pitchers between #3 (McGregor) and #7 (Hoyt) on my list are all extremely bunched up, so there's room to move them around as you see fit, but that's the way I see them. Stieb was absolutely without question the top pitcher in the AL in 1983, then Quisenberry, then all the rest. The lefties re-emerged in 1983, after only one (Bannister) making my list in 1982. McGregor, Guidry, Bannister, and Honeycutt represented southpaws in 1983. Honeycutt was an interesting story that year, as he finished up the season going 2-3, 5.77 for the Dodgers in the NL, yet won the AL ERA title (2.42) for his work with the Rangers, and managed to do enough in his 174.2 IP in the AL to make my list. Two relievers made the list (Quisenberry and Stanley) after three had made it the year before (Caudill, Gossage, and Stanley). LaMarr Hoyt is a more defensible choice than Vuckovich had been the previous year, but wow, no votes for Stieb. Oh well, that's what we're here to review. On we go to "The Year of the Tigers". Ah yes, 1984, "The Year of the Tigers", as the Detroit Tigers rolled to a 35-5 start on their way to a 104 win season, and a 7-1 playoff run over the overmatched Royals and Padres. It was one of the most dominant team seasons I can remember. The Blue Jays basically stayed in second place all season long and could never really close the gap on the Tigers in any meaningful way. That season Stieb and Doyle Alexander were the aces of the staff, while Leal was decent as a third starter. There was nobody else that was particularly strong pitching wise that year, and the bullpen was once again a dumpster fire. Lloyd Moseby somehow improved on his 1983 season and became a 7.0ish WAR player. Nobody would've noticed though because his batting average dipped from .315 to .280, but his defense was phenomenal. Baseball-Reference pegs it at 20 Total Zone Fielding Runs Above Average, and sets his defensive WAR at 2.2 wins above replacement, which is fantastic reassurance for pitchers from an everyday CF. Let's look at the AL's top pitchers, shall we? At least Dave Stieb got a vote this time around, as did Jack Morris for reasons unknown, except that oh yeah, the Tigers won 104 games, so we better put three of their pitchers in there. Uh no. Hernandez was phenomenal from start to finish (a 1.92 ERA over 140.1 IP - sheesh! ), and I narrowly placed Stieb ahead of him. Petry's top 15ish for me, and Morris, how about top 25ish? Quisenberry's somewhere in the top 15 for me as well. It was also a good season for the 40ish year old pitchers in the AL, as Phil Niekro (45), Geoff Zahn (38), and Tom Seaver (39) narrowly missed inclusion in my top 10. Also, whoa! Stop the presses! Bert Blyleven got some votes from the BBWAA! It's a miracle! Oh, and Stieb 5, Morris 1 in their not so friendly little contest. Stieb once again (stop me if you've heard this before) finished 1st in bWAR (7.9), and this time was 2nd in fWAR (5.6, Mike Witt had 5.9 for 1st, Alexander was 3rd with 5.0), 1st in REW (4.85), 2nd in ERA (2.83, to Boddicker's 2.79), 3rd in WHIP (1.135), 1st in H/9 (7.25), 1st in IP (267.0), 2nd in K (198), once again led the league in HBP with 11 (hitters just could not get too comfortable with him on the mound), 2nd in BF (1,085), 1st in ERA+ (146), and 3rd in FIP (3.32). It was arguably the finest season of a fine career, and yet he'd gone backwards in the voting since 1982 (4th, nothing, 7th). What did he have to do to get some serious votes? Honestly, he probably had to throw up a twenty win season (he had a paltry 16 in 1984), which as we all know is completely under the control of the pitcher. Wait, what? It's not? Silly me. Enough bitterness, let's move on to the Drive of '85, shall we? What a special, special season this was for those of us that were lucky enough to have been there. Everything seemed to click, well except for Bill Caudill. Jimmy Key walked into the rotation coming off a none too inspiring debut season out of the 'pen, and put up an excellent first full season as a starting pitcher. Doyle Alexander backed up Stieb and Key with some very solid starting work of his own. Lamp and Lavelle were solid out of the 'pen, and when he finally arrived in late July, Tom Henke quickly captured the role of closer in a way that this organization had probably never seen before. Tom Filer went 7-0 in 9 GS and provided solid depth in the rotation when the team really needed it, and Jim Clancy re-emerged as a guy who could be counted on for at least solid mid to back end rotation work. Unfortunately, this year would mark the end of the Stieb, Clancy, Leal trio as Luis blew up real good, to the tune of a 3-6 record, with a 5.75 ERA. Jesse Barfield, finally freed from his platoon shackles was able to put up a monster 7.0ish WAR season. Bell and Fernandez put up 4.0ish WAR seasons in their first full seasons. 21 year old Cecil Fielder was called up in mid-July and potentially gave fans a taste of what was to come, just not much of it with the Blue Jays, as it turned out. He hit .311 with 4 HR in 81 PA including a double and a walk in two plate appearances in his debut against Oakland. Did somebody say playoffs?!!! Yep, there were those as well, as the team moved into a tie for first place in the AL East on May 12th and maintained either a tie for first or the outright lead the rest of the way. The Yankees refused to make it easy for our guys, but in the end the Blue Jays put 'em away 5-1 on a very chilly, but joyous afternoon in early October down at the Ex. Back in those days, security was somewhat lax, and those of us that were there stormed the field in triumph, scooping up handfuls of dirt. Bases may have gone missing too, but the plate and the mound were protected by the cops. Had we really just beaten the big bad Yankees? Hell yeah! Bring on the Royals! It started off well enough with KC. The first game was a 6-1 beat down with Stieb on the mound. It was glorious. I was there again in the grandstand. The next day was a 6-5 comeback off Quisenberry in 10 innings with RBI singles from Moseby and Al Oliver in the bottom of the 10th to turn a 5-4 deficit into a 6-5 victory. It seemed like everything was going our way. Then, Bobby Cox decided pitching to George Brett (179 OPS+ in 1985) was a good idea, despite the fact that the Royals had only two other hitters on the team with an OPS+ above 100 in Hal McRae (118) and Steve Balboni (112). That's a situation that screams "We're not going to let this guy beat us!". Nope. Brett went 4 for 4 in Game 3 with a couple of homers, 3 RBI and 4 runs scored...And no walks. Ugh. Royals 6, Blue Jays 5. Ok, still up two games to one. We got this. Game 4 was a nailbiter. Royals up 1-0 heading to the ninth, when Moseby came up with a game-tying double off Leibrandt and Al Oliver once again delivered against Quisenberry with a two-run double. 3-1 final for the good guys, and up 3 games to 1 in the series. Just one more win and we'd see the first ever World Series in Canada. Things unfortunately derailed from there, and the ultimate exclamation point was provided by Jim Sundberg's bases clearing wind blown triple off the top of the RF fence in Game 7 in a four run 6th for the Royals. A 6-2 loss on the heels of 2-0 and 5-3 losses, and out we went. Talk about a dagger to the heart. Gut wrenching, soul crushing. Use whatever descriptor of agony you want, this was it. Ack! (No, not you Jim Acker) 11 days before had been the highest of highs, and this was just a punch to the gut. It was a great season and still ranks as the most wins in a season in team history (99-62), but how much better could it have been? Aargh! Now, how about those pitchers Tom? How did they do? Is that me agreeing with the BBWAA for the first time in these first seven seasons? Why yes, I believe it is. 21 year old Bret Saberhagen won the Cy Young Award in 1985 and absolutely deserved it. He led the AL in bWAR (7.3), was 3rd in ERA (2.87), 2nd in W (20, Guidry 1st with 22), 2nd in WPct (.769, Guidry 1st at .786), 1st in WHIP (1.058), 1st in BB/9 (1.45), 1st in K/BB (4.16), 3rd in ERA+ (143), 1st in FIP (2.89), 2nd in fWAR (6.2, Blyleven 1st with 7.0), 1st in WPA (4.49), and 2nd in REW (3.63, Stieb 1st with 4.52). It was a phenomenal season for a very, very young pitcher. Quisenberry must've been an amazing quote like Vuckovich, as he continued to show very well year after year, whether it was warranted or not. I would say he was 15th - 20th or so this time around, not tied for third. As for Alexander, Britt Burns, and Donnie Moore, they all had strong years, but not top ten type strong years. Close, but no cigar. Bert Blyleven narrowly edged out Dave Stieb for the number two spot IMO, with a very strong season over close to 300 IP. How about 40 year old Tom Seaver cracking the top ten? Awesome. Speaking of awesome, Stieb 6, Morris 1, and all 6 Stieb wins have come in the 1980s so far. I must've forgotten, who was the pitcher of the 1980s again? That's right, the guy that I've so far seen fit to award 3 Cy Youngs, one 3rd place finish and a 6th place finish to in seven seasons. Morris so far has a 7th place finish, two 8th place finishes, and a 10th place finish, which is very good, but I don't think it quite fits the definition of "pitcher of the 1980s" particularly when you consider that we're just talking about the AL with these rankings. There's a whole other league out there. It's beyond the scope of this series of articles, but it is there. With Dave Stieb an absolutely solid #3 in these rankings, Jimmy Key at #10 and Doyle Alexander narrowly out of the top ten, the Blue Jays had a very strong front three plus Jim Clancy who had a decent, but somewhat interrupted season (due to injuries), which gave them four very capable starters in this magical season, but it just wasn't enough to get them over the hump in the postseason. Still, a trip to the postseason in the ninth season of the franchise's existence was a remarkable accomplishment. Also, the bullpen looked strong again thanks to the emergence of Henke, and the strength of Lamp and Lavelle. The position players were probably the strongest they had ever been, so full speed ahead right? Not so fast folks. Baseball has no regard for your theories of linear progression and how things "ought to go". Baseball can be extremely cruel and completely unpredictable in fact. 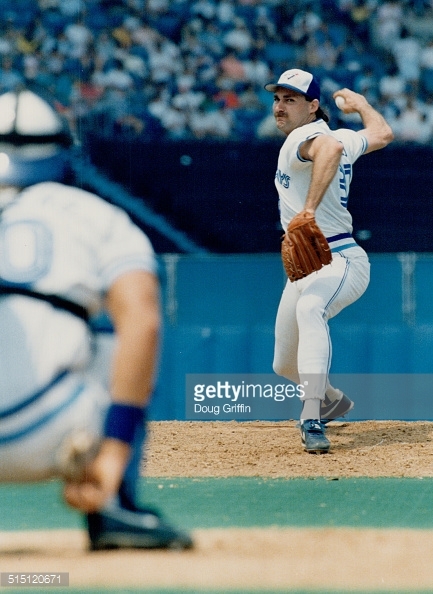 Speaking of cruel, Dave Stieb's slider anyone? (Oh my!) Let it (and the reactions it elicits from befuddled hitters) tide you over until the next installment.